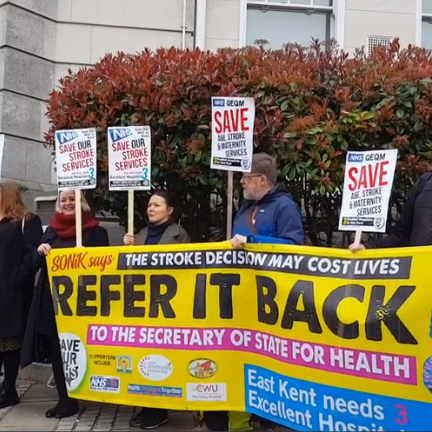 More protests are taking place today over a decision to open three specialist units in #Kent to treat stroke patients. Campaigners aren't happy current facilities in #Thanet and #Medway will be closed with the new centres opening at hospitals in #Ashford, #Dartford and #Maidstone. They want councillors meeting today to refer the decision back to the government. Dr Coral Jones is from the campaign group Save Our NHS In Kent.